Long View's contracting staff focus primarily on timber harvesting projects associated with the long term management of forests. Crews also build multi-use forest roads and trails and do occasional clearing projects to reclaim or establish open land for permanent fields, views, or building projects. Long View specializes in a logging system called "cut-to-length" where trees are brought out of the forest already cut to the correct log lengths (generally 8-20 feet) for delivery to sawmills, paper mills, and other log buyers. This system is in contrast to "tree length" logging where stems are brought full length out of the forest and cut into shorter lengths at the the landing. While both systems have advantages, we find cut-to-length harvesting to be the best approach in our area for a wide range of projects aimed at protecting soils, water resources, and trees growing for the future. Quality roads and trails provide safe and reliable access to the forest year round for both recreation and management. 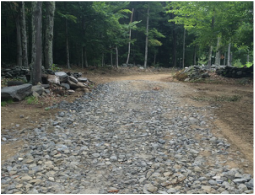 Long View's contracting staff regularly maintain, improve, and build new access to properties including "landing" areas for stacking logs and roads and trails for truck and equipment travel. These multi-purpose features greatly enhance a property's management potential as well as opportunities for walking, skiing, or getting around the woods on an ATV, snowmobile, tractor, or in a truck. While tree and land clearing is not our specialty, we regularly cut small areas for views, to reclaim or establish field or wildlife habitat openings, or for building projects. We can efficiently remove any salable logs from trees that need to be cleared and leave tops and branches scattered on site, piled for burning, or hauled away for disposal elsewhere. When stumps need to be removed we bring in outside contractors with grinding equipment or use excavators to dig them out. In his role as Contracting Division Manager Logan splits his time between lining up new work and coordinating crew schedules, log sales, and trucking. He joined Long View full time in 2012 after earning a B.S. 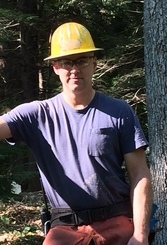 degree in Forest Operations Science from the University of Maine at Orono. Logan started off doing field forestry, next ran a forwarder, and then a harvester before switching to his current role. 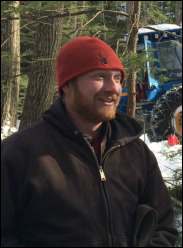 He lives in Putney, VT.
Paul joined Long View in 2014 after graduating with an A.S. degree in Forest Technology from the University of New Hampshire's Thompson School. After a year and half at Long View, Paul demonstrated that while he is good at operating equipment, he is even better at fixing it. Paul currently lives in Brownsville, VT and roams Long View's full work area making sure machines are well maintained and in good working order. Rod joined Long View in 2016 after more than ten years of contract work with Long View. During this time, Rod pioneered our shift from chainsaws to harvesters and helped drive the growth and development of Long View's logging operations. He now takes the lead setting up new projects building roads and landings and continuing to log in the winter. Rod lives in Putney, VT with his wife and son and likes to go downhill on his mountain bike or snowboard in his free time. Despite his youth, Mike is the third longest term member of the company. He joined Long View in 2004, is a skilled and experienced equipment operator, and an active participant in the management of the business. He currently runs a harvester but also has experience as a chopper and forwarder operator and building roads, trails, and landings. Mike lives in Cambridgeport, VT with his wife and two sons and is an avid hunter in his free time. ​Kyle joined Long View in 2008 and has great passion for felling trees with a chainsaw. 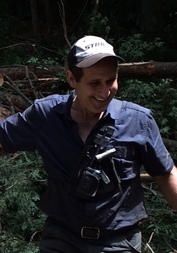 When he's not chopping, he is often operating a forwarder or teaching anyone new to Long View the ways of the woods. 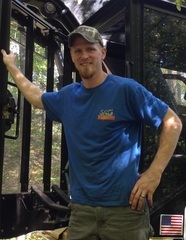 Kyle earned a forestry degree from the SUNY College of Environmental Science & Forestry in 2008, has spent time cutting trees in California, and is also a Game of Logging instructor. He lives in Putney, VT with his wife and daughter and really likes to work. After graduating from Paul Smith's College in 2005 with an A.S. in Forest Technology, Dylan worked at Long View for two years before moving home to Newbury, VT to start his own business. After several years as Egypt Brook Logging, Dylan rejoined Long View as the founder and driving force behind a new "Northern Crew". When he is not at work Dylan is busy at home with his family and especially enjoys sugaring with his kids and playing the fiddle. Ben joined Long View in 2013 and splits his time between operating a chainsaw and a forwarder. Besides having logging skills, Ben is also an experienced tree climber and operates his own business as Borderline Tree Works. Ben lives in Bradford VT, earned a B.S. in Forestry from Paul Smith's College in 2008, and enjoys (among other things) growing garlic and making maple syrup in his spare time. Larry "The Logger" Altman has over 20 years of varied logging experience in business for himself and working for others. Most recently and before joining Long View in 2014, he was hand falling large timber on mountain slopes in North Carolina. When he is not operating a harvester or hand cutting for Long View he enjoys going on bike rides with his daughter and riding his motorcycle. He lives in Lyme, NH. Steven currently operates a forwarder working with his brother Mike as part of the "King Crew". Steven joined Long View in 2010 and spent several years chopping full time before making the switch to operating equipment. He is careful, consistent, and productive at work and also a dedicated hunter in his free time. Steven lives in a house he built himself in Westminster West, VT.
​Will grew up working for his family's logging business and a local dairy farm before earning a B.S. in Forestry from Paul Smith's College in 2015 and then joining Long View. 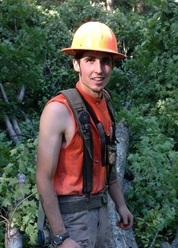 While at Long View, Will has worked with the Woodland Services crew, harvested white birch bark, and then switched to full time logging with the "Northern Crew" in 2016. 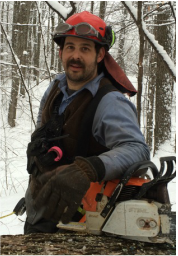 He lives in Bradford, VT.
Jake started full time with Long View in 2013 and quickly become a key part of logging operations. He came to Long View with prior logging and construction experience and quickly proved himself a skilled chopper and forwarder operator before making the leap to operating a harvester. Jake grew up in Rockingham, VT and makes a lot of maple syrup every spring with his dad. 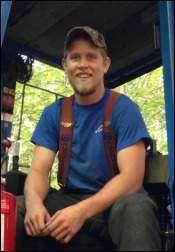 Nate joined Long View in 2016 after completing military service in the U.S. Marines, earning a forestry degree from Paul Smith's College, and gaining varied work experience in excavation and logging. He currently operates a forwarder and lives with his wife and family in Wentworth, NH. Trevor started with Long View in 2017 after several years full time logging experience with other contractors. He lives in Jacksonville, VT and works part-time as an auto mechanic when he's not logging or riding his motorcycle. Thom worked two summers for Long View's woodland services crew while attending Paul Smith's College and earning a degree in forestry. He started full time after graduating in 2017 and made the switch to logging as soon as the opportunity arose. Thom lives in Marlow, NH. Banner photo at top: One of Long View's harvesters and forwarders working together on a winter harvest in Westminster, VT.